Clearwater Beach, Florida is known around the world as a top vacation destination. Its white, sandy beach which stretches for miles along the Gulf of Mexico is frequently ranked among the top beaches in the United States. In addition to the hotels, restaurants and shops, Clearwater Beach also has a vibrant residential community of about 8,000 residents. It's most famous resident, however, is not even human. The Clearwater Marine Acquarium is home to Winter, the dolphin, featured in the movie Dolphin Tale and its sequel. If you are seeking a Clearwater Beach pool builder to turn your back yard into the ideal Clearwater Beach outdoor living space for you and your family, consider Grand Vista Pools. 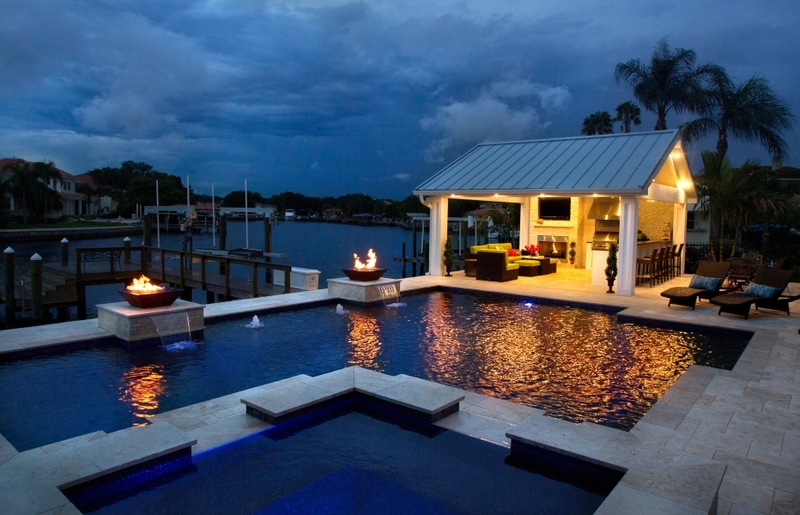 We've been building new swimming pools in Clearwater Beach and the Greater Tampa Bay Area for over 20 years. One of the things that makes Grand Vista Pools special is that in addition to being an experienced pool builder, we are also a licensed general contractor. Because of this, we can design and build your entire outdoor living space, including renovations or an addition to your home to help your existing indoor living space connect with your new outdoor living space. Clearwater Beach real estate has been in high demand for decades. As a result, most of the homes and their pools are in the neighborhood of 30 to 60 years old. If you have an older pool that needs remodeling, Grand Vista Pools can not only make your pool look as good as new but better than new. Want to add water, lighting, or fire features? How about a spa or a waterfall? We can do it all - from pool resurfacing to an extreme makeover. With a beautiful view and a comfortable breeze blowing in off the water, you'll want to spend as much time as possible outside enjoying your tropical paradise. Grand Vista Pools can design and built an amazing outdoor kitchen for you and your guests to enjoy. Whether you envision a fun outdoor bar, the manliest of outdoor grills, or a full outdoor kitchen, we can create the perfect outdoor living space for you.